The Allianz League got underway over the weekend. Here are summaries from the big games. Monaghan fought back from six points down to stun Dublin 2-13 to 1-13 in the Football League Division One opener as Tyrone and Cavan both lost. Dublin led 1-6 to 0-3 helped by Niall Scully’s goal but Monaghan regrouped to trail by only two at the interval. Sub Stephen O’Hanlon’s goal saw Monaghan levelling at Clones and Conor McManus’ arrival inspired the Farneymen as he set up a Shane Carey goal. Kerry defeated Tyrone 0-11 to 0-7 as Cavan lost 0-13 to 0-11 in Galway. Niall Morgan kicked Tyrone’s only first-half point as they trailed by four at the interval and the Red Hands never got closer than two in arrears in the second half as free-taker Sean O’Shea kicked six of Kerry’s scores. 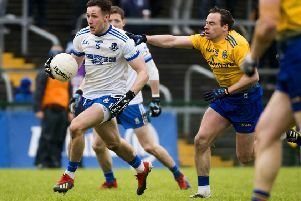 Cavan led by three points after 24 minutes at Salthill but Galway levelled at 0-5 to 0-5 by half-time and the Tribesmen took control to move into a 0-13 to 0-8 lead and held on despite a late Breffni rally. Galway punished Cavan’s indiscipline in the crucial second period as Mickey Graham’s side were reduced to 12 players at one stage following three sin-binnings. 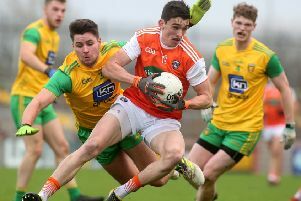 Donegal made a winning start in Football League Division Two by beating Clare while fellow Ulster sides Armagh and Fermanagh opened with draws. Michael Langan slotted over four points as Donegal secured a 0-16 to 0-13 away victory over the Banner county. Stefan Campbell netted as Armagh led by five points against Kildare but the hosts hit back to draw 0-14 to 1-11. A last-gasp Conall Jones score earned Fermanagh a 0-8 to 1-5 draw with Cork at Brewster Park. Jones took a mark five minutes into added time and held his nerve to ensure the Ernemen began the campaign with a point. Any notions that promotion is a formality for Derry were dispelled amid a thrilling, opening day Division Four victory for the Oak Leafers against Antrim in Corrigan Park yesterday, WRITES MICHAEL WILSON. Padraig Cassidy’s injury time fisted point eventually settled an absorbing affair which Lenny Harbinson’s Saffrons will feel hard done by not to have taken anything from. Damian McErlain has been at pains to pint out to anyone who would listen that this league will be a dogfight of a division and his words could not have more accurately described the bitterly cold, wind swept Sunday against opposition who were treating the fixture with Championship intensity. The game could have hinged on any one of six or seven pivotal moments. Even after Cassidy edged Derry in front it took a breathtaking Michael McEvoy block on Owen McKeown’s shot to ensure the two points would be heading back over the Glenshane. McErlain handed league debuts to Sean Quinn, Eoghan Concannon and Eamon McGIll after some impressive displays in the McKenna Cup but any hope of an open expansive first half were destroyed by the gale force wind blowing straight down Corrigan Park. Derry had the elements in the opening half and while they built a 0-6 to 0-1 interval lead, having the wind at your back was almost as troublesome as trying to play into it. Chrissy McKaigue was detailed to pick up Matthew Fitzpatrick but with Antrim getting plenty of men behind the ball, space was at a premium inside the Saffron half. Indeed it took 10 minutes before a Christopher Bradley free finally got the scoreboard up and running thought it was quickly added to by a lovely long range effort from Ciaran McFaul. Another Bradley free had Derry 0-3 to no score up by the 15th minute. When Karl McKaigue fouled Ryan Murray, it gave the Lamh Dhearg forward the chance to grab Antrim’s sole score of the first half from the resultant free but the could have had a goal seconds later. Martin Johnston got himself clear on the left and fired a low shot toward goal only to see Thomas Mallon produced an excellent low stop. Conor McAtamney grabbed Derry’s fourth point before Lynn added a fifth but the game lacked any real fluidity with runners constantly being blocked or pulled back. When McFaul was fouled, it gave Bradley the chance to register his third free of the half for a five point half time lead for Derry but there was little sign of the second half drama to follow. Antrim came out fired up and point from Paddy McBride and Colum Duffin brought Derry’s advantage back to 0-6 to 0-3 and gave the home support something to cheer. That’s enthusiasm looked to be doused when Michael McCarry upended Enda lynn as he went through on goal. The Antrim defender somehow escaped a trip to the sin bi but Shane McGuigan extracted the necessary punishment by firing the penalty high into the Saffron net. At 1-06 to 0-3, Derry possibly thought they had weathered the storm. They hadn’t. Less than three minutes later, a superb Martin Johnston tackle on Ciaran McFaul turned Derry over just inside the Antrim half with too many men committed forward. The ball was quickly transferred through Johnston, Duffin, Niall Delargy and eventually McBride who fired home for close range and suddenly Corrigan Park senses blood. Derry responded well through a Patrick Coney point but when McBride’s free was added to by a huge Stephen Beatty score, the game was in the melting pot at 1-07 to 1-05. Mark Sweeney produced a superb block to ensure McGuigan didn’t get a second goal as Lynn pushed the Oak Leaf advantage out to three points with a lovely free against the wind. Again Antrim rallied with Murray (free) and a lovely McBride point before McFaul’s attacking mark left it 1-09 to 1-07 with minutes to play. Saffron substitutes Patrick McCormick and Owen McKeown had the Corrigan Park crowd in a frenzy with two quick points that brought Antrim level just as the clock hit injury time but again Derry responded. Coney won another penalty but this time Lynn’s spot kick was superbly saved by Padraig Nugent. That fired the home crowd even more but just when Derry needed settling, Cassidy got himself on the end of a flowing move to fist the point that secured the win. There was still time for McEvoy to produced his superb block. Derry had done enough. Just. Antrim: Padraig Nugent; Eoghan McCabe, Ricky Johnston, Patrick Gallagher; Niall Delargy, Michael McCarry, Declan Lynch; Mark Sweeney, Fintan Burke; Kevin Quinn, Matthew Fitzpatrick, Paddy McBride; Colum Duffin, Martin Johnston, Ryan Murray. (Subs) Owen McKeown for E McCabe, 44mins; Stephen Beatty for K Quinn, 46mins; Ruairi McCann for M Fitzpatrick, 47mins;Patrick McCormick for M Johnston, 63mins; Ruairi McCann for F Burke, 63mins. Derry: Thomas Mallon; Sean Quinn, Karl McKaigue, Eoghan Concannon; Eamon McGill, Christopher McKaigue, Jason Rocks; Conor McAtamney, Ciaran McFaul; Patrick Coney, Emmett Bradley, Padriag Cassidy; Enda Lynn, Shane McGuigan, Christopher Bradley. (Subs) Michael McEvoy for J Rocks, 44mins; Jack Doherty for E Bradley, 57mins; Niall Toner for S McGuigan, 57mins; Paul McNeil for Sean Quinn, 72mins. Antrim finished with 13 men as Kerry held off a Saffrons fightback to earn a 1-21 to 2-16 victory in the Division Two A Hurling League opener. After Nicky McKeague’s early red card, Kerry moved into a 1-9 to 0-2 advantage before Eoin O’Neill’s goal cut the margin to 1-12 to 1-6 by half-time. O’Neill’s second goal shortly after half-time left Antrim only one behind. But with Shane Conway finishing with 0-12, Kerry held on as Antrim’s Keelan Molloy was sent off on 64 minutes. As had been the case in the Kehoe Cup, James McNaughton was Antrim’s main scoring threat as his 12th and final point came in injury-time as he attempted to go for goal from a 25m free only for his mishit shot to bounce over the bar.